The video shows the mason laying Omni Block with one hand. The mason is laying the block in a stack bond that will be exposed naturally. Extra care is always warranted in this situation and slows the daily productivity of even the best mason. 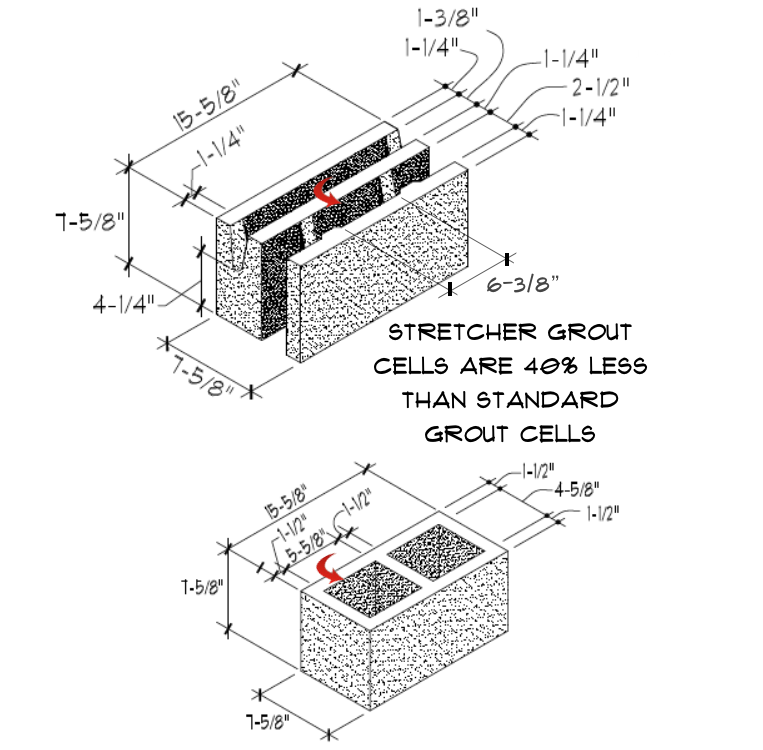 This link Grout Cell Calculations provides the individual grout cell information (cubic inches, cubic feet, and cubic yards) for each type of block that should enable masons to accurately determine the amount of grout that will be required on a project and therefore more accurately bid the project. The individual wall thicknesses of Omni Block units are 1.25″ whereas many of the standard CMU thicknesses are 1.50″. The calculations presented here are based on this assumption, making the cells of the 8″ and 12″ standard CMU slightly smaller than the Omni Block corner and jamb block cells. Many block plants have switched to the newer 1.25″ wall thickness which would make the Omni Block units and the standard CMU almost identical. The Omni Block stretcher cells of the 8″ and 12″ units are identical. The 12″ Omni Block stretcher cell is about 67% less than the 12″ standard cells, while the 8″ Omni Block stretcher cell is about 40% less than the 8″ standard cells. 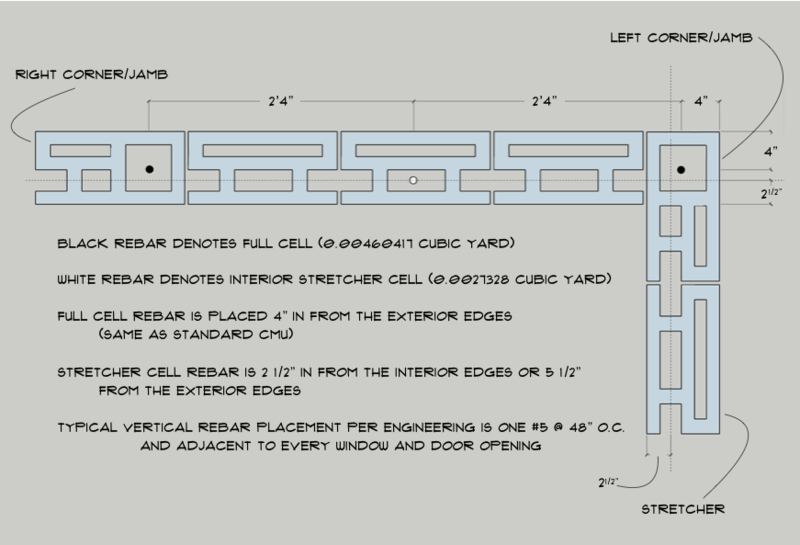 The drawings included in the calculations provide these details. The videos linked below depict a mason that was literally just “hired on” with no previous Omni Block experience, climbed the scaffolding and started laying Omni Block. A classic “on-the-job-training” exercise. 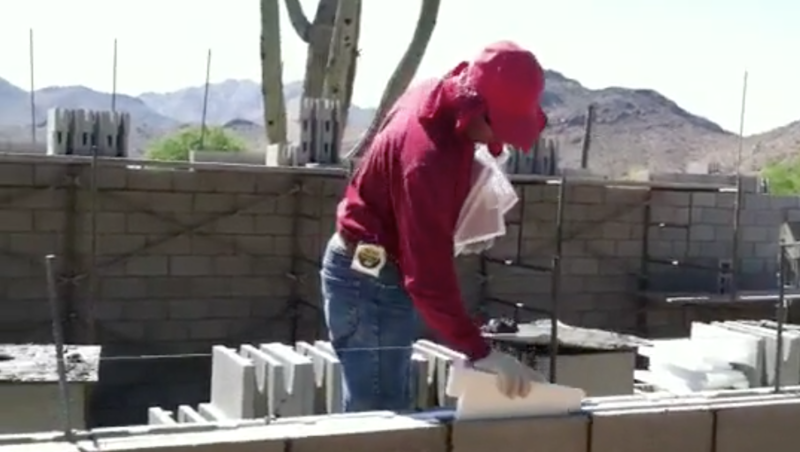 The videos show that Omni Block is a “one-handed” block, which was manufactured in Tucson, Arizona by Central Arizona Block. It is a medium-weight block weighing an average of 33 pounds. This puts the block mix design at about 105 lb. density. The second video shows the mason installing the short insulation insert into the interior block cavities. There is only one way that foam can be put into the cavity, so it is “completely foolproof”. As shown in this video, which is 22 seconds long, the mason installs 7 short foam inserts and has not even gotten the hang of doing it yet. 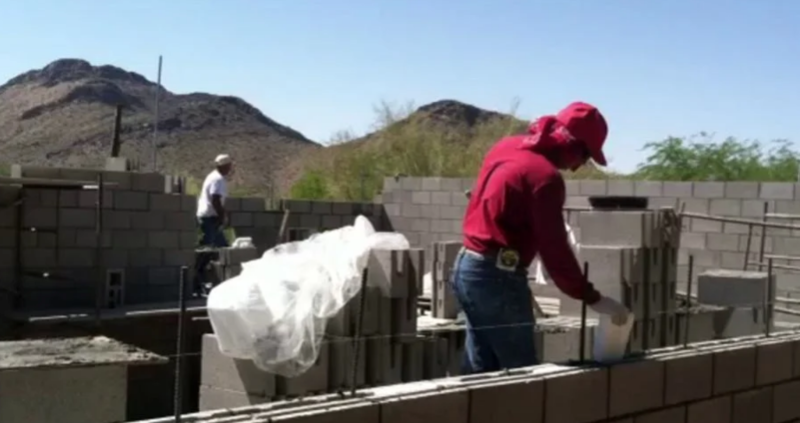 If you pay a mason $30 per hour and charge $0.25 additional per insert to the total masonry bid, how many inserts must he install on average during the project? This mason is not at all racing or working at an unsustainable pace, so it is possible to average 1200 inserts in an hour or $300 in revenue at $0.25 per insert. 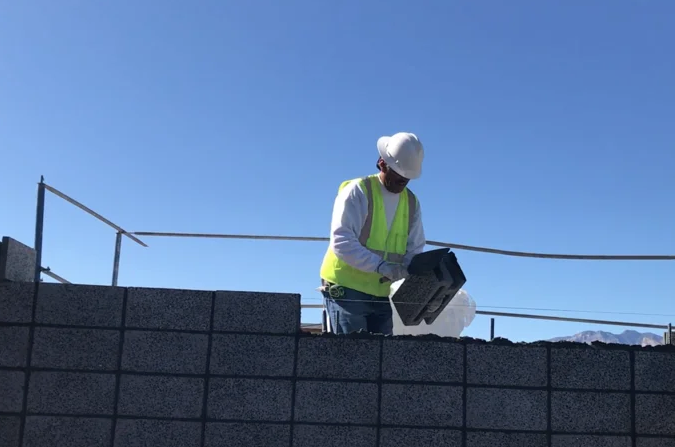 The third video shows the mason installing the long insulation insert into the exterior block cavities. There is only one way to install the long insert into the exterior cavity, again making it intuitive, thus requiring zero training. This video is 20 seconds in length and the mason installs only 5 inserts. This would equate to $225 of revenue per hour. Many masonry companies initially think that a hod carrier can install the inserts. This is economical during the first lift, but it has been determined many times over that once the mason is on the scaffolding, the hod carrier gets in the way and thus is counterproductive. 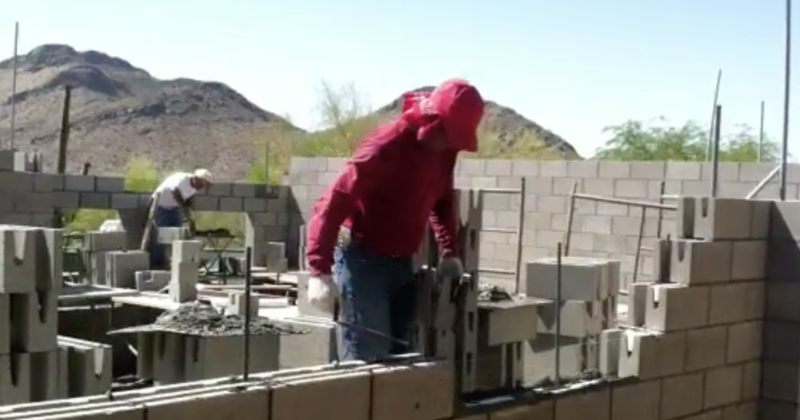 Once a mason lays a course, he then installs the inserts and what most masonry contractors realize is that the mason can lay as much block in the afternoon as he did in the morning because he in effect has “paced” himself.